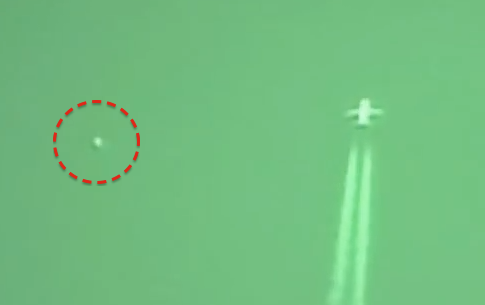 UFO SIGHTINGS DAILY: UFO Move Toward Jet Over Australia, Seen in Infrared, July 2016, Video, UFO Sighting News. UFO Move Toward Jet Over Australia, Seen in Infrared, July 2016, Video, UFO Sighting News. This video was taken with a special infrared converted camera. All cameras have a filter in them to cut out the infrared. This camera he uses has had the filter taken out so it can see infrared, then he placed the IR filter over the lens so only IR light is seen. More about IR cameras here. This orb was caught flying past a passenger jet over Australia this week. The orb just appears out of nowhere and slows down near the jet as if it were scanning it. Orbs are often seen near jets and contrails. This is a very nice catch by ColourUFO of Youtube.